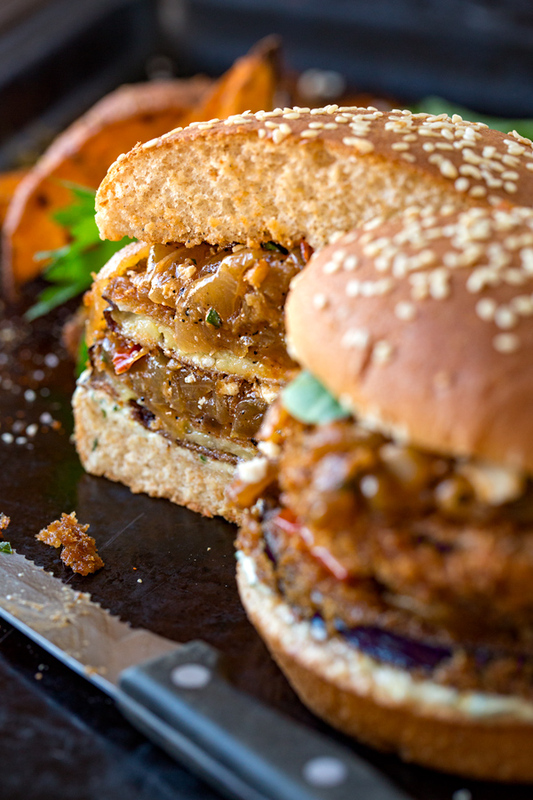 If you’re looking for a unique and delicious vegetarian burger full of, well, veggies, look no further than this mediterranean-inspired crispy eggplant burger with caramelized onions and tomato jam to tantalize your tastebuds. Don’t get me wrong, I utterly love a great beef burger; but there are times when the craving hits for a slightly unconventional burger, a savory veggie burger, full of flavor yet of a slightly different texture. Typically veggie burgers are made with beans such as chickpeas or black beans, and are mixed together with some binding ingredients, perhaps even some rice or quinoa, and a few herbs and spices—they’re perfectly scrumptious, and are the “classic” when I think of a veggie burger. But then there are times when I want a vegetarian burger of yet a different variety, without any beans or binders, flavorfully and creatively prepared, with some unique and palette awakening fix-ins to go along. I’m a huge fan of cooking with eggplant, because it’s one of the most versatile pieces of produce there is. 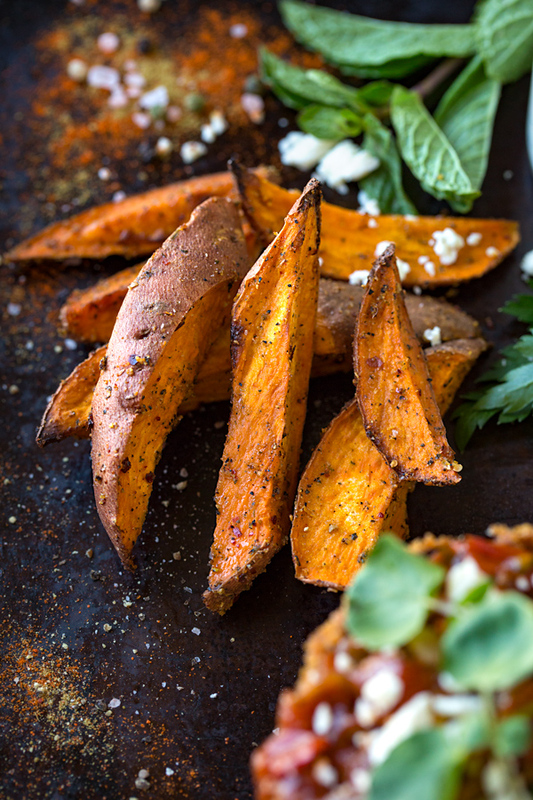 This low-calorie member of the night-shade family (same as tomatoes and potatoes), rich in fiber, calcium, vitamin K and C, as well as phytonutrients, is a great candidate for roasting, grilling, sautéing, and frying, which is why I love it as an option for a vegetarian burger. 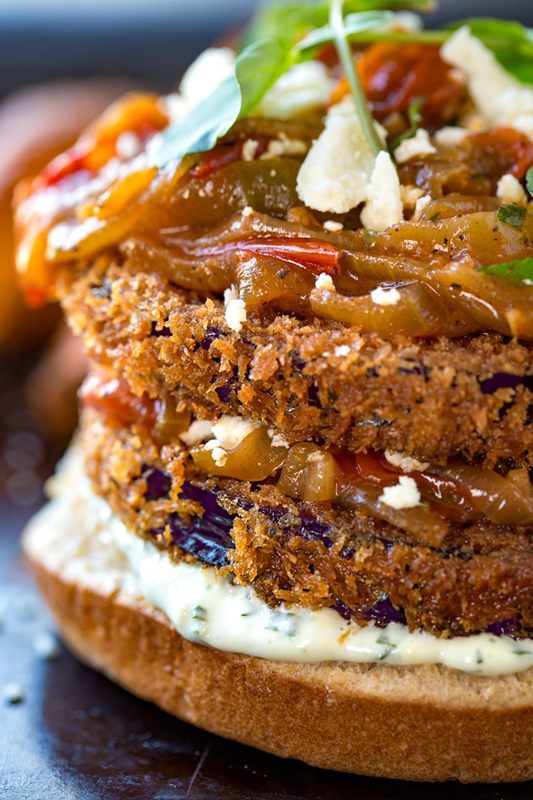 A crispy, savory, and mediterranean-inspired veggie burger, to be exact. Eggplant soaks up any flavors you pair it with, which makes it an ideal canvas to work with when creating a delicious burger; so when slices are seasoned and then lightly coated in a little egg wash and some light and crunchy panko bread crumbs, then gently fried until golden, what you have is the beginning of something scrumptious. And when caramelized onions and spiced tomatoes are added as a topping, along with a salty sprinkle of feta and a spread of fresh parsley-mint mayo? Then you’ve truly got a burger unlike any other. And believe me, you won’t miss the meat (or the beans), one iota. 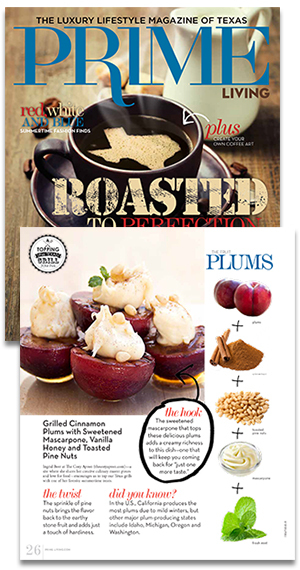 • Simplify your process, or do ahead: This recipe is simplified when you prepare all of your components first. 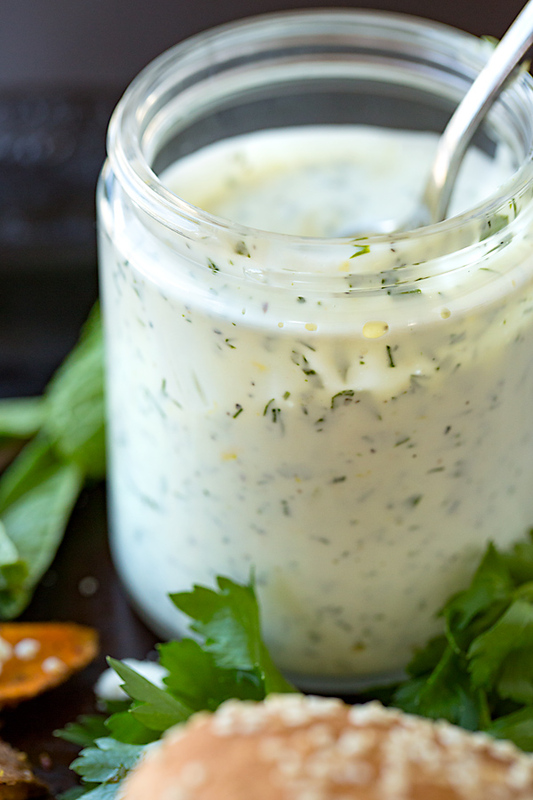 Begin with the parsley-mint mayo, and keep that in the fridge. Prepare the caramelized onions and tomato jam, and keep that covered and warm. • Keep the heat moderate for frying: Take care not to fry the eggplant too quickly, on too high heat, making it too dark on the outside and not cooked through on the inside. Keep your heat to a medium or medium-high once it’s hot enough to begin frying, and allow for the slices to become golden-brown more slowly to ensure the inside is tender and cooked through. 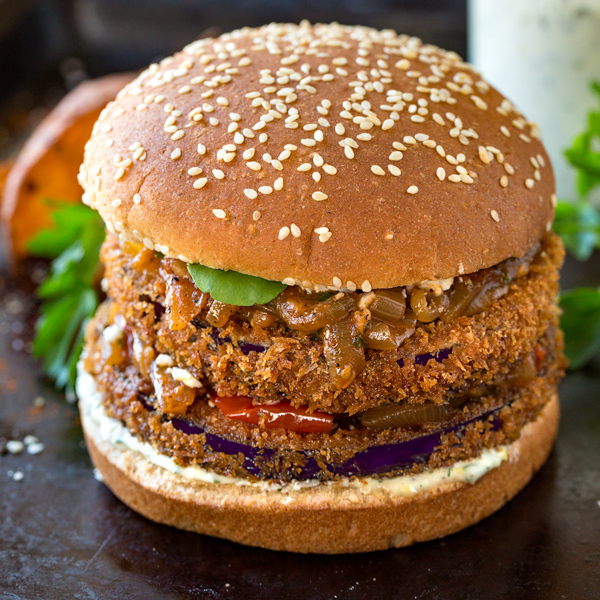 • Turn up the spiciness: You can make these burgers more spicy (which I love) by being a little more heavy-handed with the cayenne—just sprinkle on some extra right after you fry your eggplant. Sprinkle some salt and pepper on both sides of the slices of eggplant, along with a pinch or two of cayenne pepper, and allow the slices to sit for 5 minutes. -Dredge each eggplant slice in the flour, then dip into the whisked eggs, and then dredge in the panko breadcrumbs, pressing a little bit so that the panko adheres well; set the slices onto a parchment-lined baking sheet to hold. -Add enough vegetable oil to a large heavy bottom pan to shallow fry (about a couple of inches), and heat the oil on medium-high until hot, or it shimmers and has tiny bubbles forming; add several slices of eggplant into the hot oil (work in batches) and fry on that first side about 4 minutes, then flip and fry on the second side for another several minutes, or until golden-brown, and tender; allow to drain on a wire rack set over another baking sheet. -Once all slices are fried, place into “warm” oven for 10 minutes. 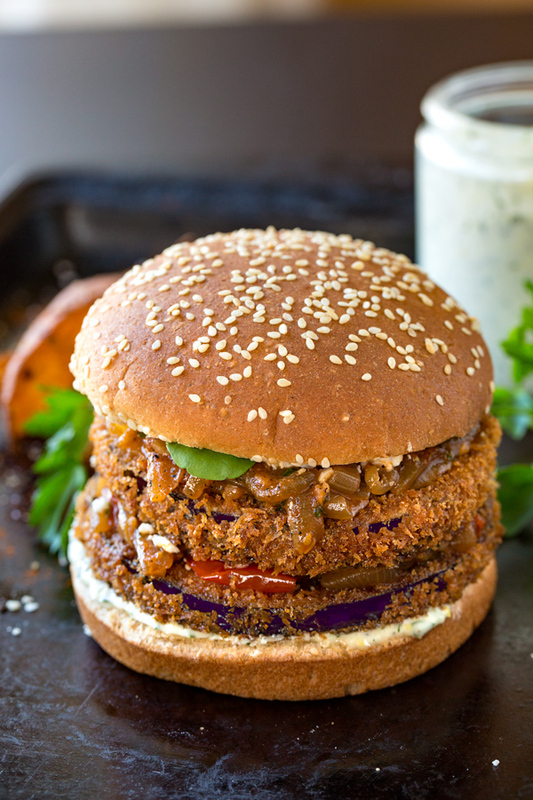 -To assemble the burgers, spread a little of the Parsley-Mint Mayo on the buns, top with a slice of the crispy eggplant, then spoon some of the Caramelized Onions & Tomato Jam over; repeat the process again with a second slice of eggplant; then, sprinkle on a touch of the feta, then a few sprigs of the watercress, and top with bun and serve with chips, salad, or sweet potato wedges. -Whisk all ingredients together in a small bowl, and keep chilled in fridge until ready to use. -Heat a large cast-iron skillet or pan over medium-high heat with about 3-4 tablespoons of the avocado or olive oil; once the oil is hot, add in the sliced onions along with a good pinch or two of salt and black pepper, and caramelize them, stirring frequently, for about 12-15 minutes. -Once golden-brown, add to the cumin, coriander, pinch of cayenne and the garlic, and stir to combine; once aromatic, add in the tomatoes, plus another pinch or two of salt, and stir those in until they begin to break down, about 4-5 minutes; add the squeeze of lemon and the chopped parsley, and keep warm until ready to use. For as long as I can remember, that small quiet voice within me that gives me a gentle nudge, or prompts me to go in a particular direction, has been a friend to me. What I do know is that I try my best to stay open to it as much as I possibly can, to keep my antennas up and ready to receive it, because I rely on it to guide me along on my journey in this life. 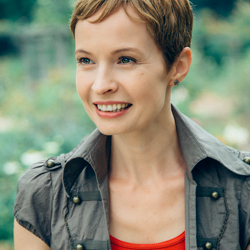 This quiet inner voice always prompts a change of some kind, be it in how I perceive something, or how I approach it, and I have found that what that quiet voice longs to do is to help me find the truth in something, even if it is hidden or if I’d prefer not to face it and rather keep it obscured. …sometimes, old acquaintances and old relationships need to be turned away from because they stifle and hold in captivity the very life force that longs to be flung into the world boldly and wildly, so it can be free. See, change really is what creates newness and freshness; it offers an opportunity for the continuation of a healthy existence, of a life that is vibrant and worth living, and constantly evolving. The desire for it seems to be written into our very DNA. Change often manifests as a shift in direction. It manifests as an awakening or an awareness of the need to get rid of something detrimental that closes one off, or as a desire to go after something that contains light and ultimately mercy and goodness that will open one up. If change does not occur, then that which exists yet is no longer viable or “alive”, will begin to deplete valuable resource to those areas which need the resource, and a slow death will begin to occur, a choking of all that longs to flourish. And I want life, a full and meaningful one—a rich one—at that. However, it is not easy to change course, or to set off in a new way, with new intention. To leave behind what is familiar and what one has grown accustomed to is akin to leaving behind old friends and acquaintances who’s habits and responses one knows all too well, and who, for better or for worse, are fixtures in one’s life. But sometimes, old acquaintances and old relationships need to be turned away from because they stifle and hold in captivity the very life force that longs to be flung into the world boldly and wildly, so it can be free. It goes straight to the sacred place within one’s being, and whispers that a change needs to be made so that life can continue to grow and expand, rather than shrink and contract. And here’s to courage in examining those areas in life that need some change, need a new direction, need some air and to be refreshed. Here’s to releasing “old acquaintances” that stifle beauty and freedom, and to embracing (even if on fawn legs and a nervous tummy) new ways that speak of who one is today, or better yet, who one is capable of becoming tomorrow. I long for my best self to shine, and I refuse to settle for anything less. I’m not sure which I love more, your recipe or your inspirational words after the recipe. your words after the recipe. Thank you for passing your love on to us. Deborah, thank you so much for your beautiful comment! It is so filled with love and kindness, so positive and uplifting. We very much appreciate you taking the time to write your thoughtful words, and we’re so glad to know that you are gaining some “sustenance” from both the recipe and the post below it. (And I’m thrilled that even though you’re not a fan of eggplant, that you’re willing to try this recipe! Kudos to you! I think you’ll enjoy it with all the tasty add-ins and flavors…) Much love to you. 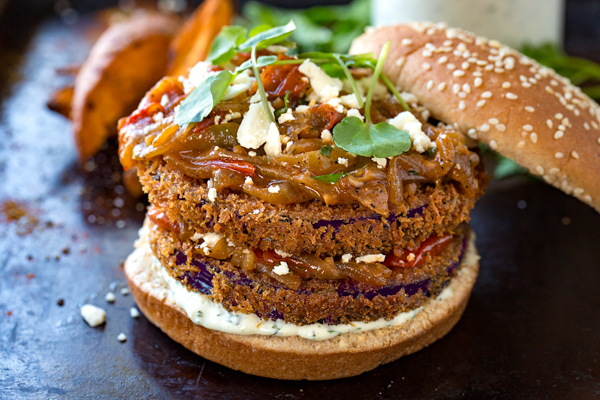 I am not a huge fan of eggplant, but these look amazing..A definite must try! Hi Jamie, I think you’ll enjoy the flavors 😉 . Such heart-felt words….sounds like there may be a change a-coming? I find I have to keep reminding myself to listen to my inner voice and intuition, so I don’t go reacting instead of reflecting and then acting. Funny, I have always said to our daughter, “listen to your own voice first. Know what it is YOUR heart is saying.” This is hard for all of us, and more so for a teen, I think. By the way, from my vantage point, your best self shines pretty darn brightly. Love them! What a nice change from the ordinary. Thanks for sharing.